Woodfield is a quiet neighborhood in the northern section of Carmel Indiana, nestled into a wooded section near the intersection of 146th Street and Grey Road. Homes are situated on large lots with mature trees and sidewalks. Homes are an average of 4000 square feet (main and upper floors) and sell in the average of the mid 400's. Residents enjoy close proximity to amenitites in Carmel, Fishers and Noblesville, as well as easy access to I-69 and downtown Indianapolis. 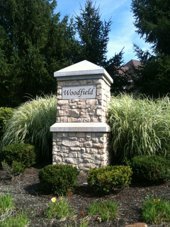 Woodfield is in the Carmel School District, specifically Cherry Tree Elementary, Carmel Middle and Carmel High Schools.